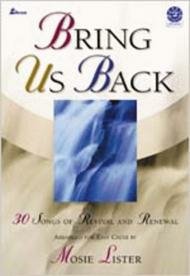 Bring Us Back (CD Preview Pack) (Songs of Revival and Renewal Arranged for Easy Choir). Arranged by Mosie Lister. For SATB choir, or flexible voicing. Choral. Excel Series. Southern Gospel and Sacred. Easy. CD preview pack. Published by Lillenas Publishing Company (LP.L-9318CD).ISBN 9780834180154. Southern Gospel and Sacred.